This is what we had last night. In a small bowl mix together Greek yogurt, Parmesan cheese, garlic powder, and whatever else your little heart desires (you could probably use sour cream if you are not a Greek yogurt kind of person). Cut your chicken into portion-sized pieces and coat in the mixture, then top with bread crumbs (optional) and bake at 375 for 20-30 minutes. I forgot to add my bread crumbs until after cooking, which explains why they’re not browned at all. I served it with quinoa and some carrots that I microwaved and then mixed with butter and cinnamon. More about quinoa in a minute. This meal is only slightly more complicated but really good and still pretty easy. Chop your chicken into bite-sized pieces and then mix with Mexican seasoning. Sauté it up in a pan whilst you warm tortillas with shredded cheese (I just used cheddar) on another pan. 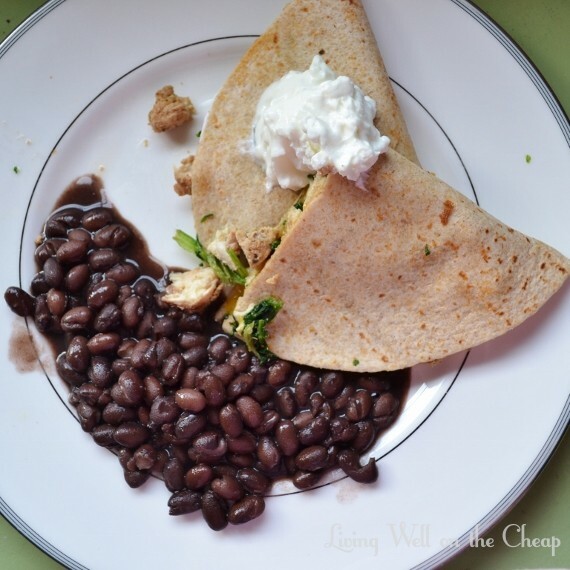 Shred your cooked chicken up a little smaller and then layer on your melted-cheese tortillas and add whatever else you want (ex: frozen spinach. Buy it in a bag instead of those shrink-wrapped rectangles so you can use a handful at a time for stuff like this) before folding it up. I also topped mine with a dollop of Greek yogurt in place of sour cream, and microwaved a can of black beans to have with it. Let’s talk for a moment about “Mexican seasoning.” The stuff at the store is usually expensive and high in sodium. I googled what went into it and mixed together whatever I had on hand, intentionally making more than I would need for this meal so that I could save it for next time. I put it in a leftover Parmesan shaker and wrote the ingredients on the back so I could make more when we run out. Next time I may omit the cloves, though. This is more of a weekend meal only because of the homemade shells and cheese I made with it. The chicken itself is not that complicated. Rub your chicken down with olive oil, salt, pepper, garlic powder, fresh rosemary (or whatever you want, really. The rosemary is totally optional). Put the chicken pretty-side-down in a hot, dry, oven-safe pan. Don’t touch it. Just let it sit there and sizzle. After three minutes, flip it over with tongs (you don’t want to pierce it and let the juices out) and pop the whole operation into a 450 degree oven for 15 minutes. When you take it out let it rest for five minutes before cutting it. I served it with this amazing sweet potato and spinach mac and cheese (I skipped the fancy cheeses and just used cheddar and used frozen spinach instead of fresh). Even my veggie-hating husband gobbled it up. Now let’s talk about quinoa (pronounced keen-wah, or if you live in my house maybe keen-to-the-wizz-ah). I thought it was too fancy for me, but after trying some that Nick’s mom made I ordered myself a bag of it from Amazon (it was way cheaper than in the grocery store). The first time I cooked it I literally thought, “Quinoa, where have you been all my life?! ?” It’s sort of like rice, but even easier to cook and significantly more delicious (and healthier!). Unfortunately, I can no longer eat quinoa. It’s pretty rare, but some people develop an intolerance to the saponin that coats the tiny seeds. After being inexplicably sick to my stomach several times within a few weeks I figured out that it was the quinoa. Rinsing it before cooking can help prevent problems, but I can’t bring myself to eat it again out of terror. Nick and Jack still love it, though! If I’m serving it as a side dish I’ll mix it with some pesto or maybe just garlic and Parmesan. If you’ve never had quinoa before I strongly encourage you to try it! This recipe is crazy, crazy delicious and pretty easy. Oh my God it’s delicious and I miss it. Easy, yummy dishes! You all needed a break from Nicholas’ pots of beans!! Hahaha yes we did! We still eat beans once a week or so, but it’s nice to have some other good meals mixed in. I actually like cooking now!